What a day! It is pretty easy for me to be jaded when it comes to concerts after seeing so many over the years – but I’ve got to admit, Brian Wilson playing SMiLE in Atlanta has to rank up there with one of the “concerts of a lifetime” on my list. Instead of just reviewing the show, I’m going to recall the whole day’s events, since it was in essence a totally Brian Wilson/SMiLE-filled day. I was scheduled to interview Brian at 10:30 am for EAR CANDY. As he was to call my number, I had everything set up by the phone: questions, recorder, etc. At about 10 am, I figure I have 30 minutes to spare, enough to shave and put my contacts in. Wrong! At about 10:10am the phone rings as I stumble to get to it, wearing one contact and grabbing my glasses along the way. The interview went great, despite the fact that the phone went dead in the middle of the interview – but Brian called back and we finished my questions. I was really psyched when Brian said, “I’ll see you backstage” – until I read several other interviews and it seems that he ends them ALL saying that! Then it was time to head for Chastain Park. I had decided to arrive there early, not only to get a good parking space, but hopefully to hear a sound check. I had already “packed” for the day: a Frank Holmes SMiLE t-shirt, SMiLE sweatshirt (in case it got cold), various things to sign if I got an autograph (CD’s & programs) and powerbars (to avoid being “raped” by the food vendors!). I parked right across from the entrance to Chastain and just sat in my car listening (of course) to SMiLE. At one point, I got out of the car to stretch. Seeing my SMiLE shirt, a lady in the car right next to me comes up and we start to chat. Diane is another Brian Wilson/Beach Boys fan (although I got the impression that she is more of a Beach Boys fan). Then Margaret Dowdle Head comes up and introduces herself. She knows Jeff Foskett and shows me some cool pictures that she has taken of Jeff live. And…she also gives me a SMiLE button that she designed! She has a handful of them and tells me she is going to give them to the band. After chatting about Brian and all things Beach Boys, we decide to walk to the other side of the venue where the band arrives. As we round the corner, we see a group of people, with various albums in hand to get signed, already there. Eventually, the tour buses come around the corner, but just drive through the gates without stopping. We decide to go back to the other side and wait near the will-call ticket window, where we could get a better view of the sound check. During sound check, Brian and his band went through “Darlin’”, “Drive Inn” and one other song that I can’t recall. After sound check more people start to arrive and I got to meet more SMiLE-minded folks, such as “Reverend Rock” and French. “Reverend Rock” cracked me up, his first words being, “is that an OFFICIAL SMiLE t-shirt?” as he pointed to my homemade SMiLE shirt (made using a handy-dandy laser printer, t-shirt transfer and a combined image of the Frank Holmes cover with Brian’s new tour logo). Although it was great meeting Brian-minded folks at the 2000 PET SOUNDS concert at Chastain, this one was even better since there were more SMiLE-minded people! Plus, it is always great to place a face with people that you’ve chatted with on the SMiLE Shoppe message board. After getting our tickets, photo pass and backstage pass, we made a beeline straight to the merchandising booth, where I got a program for my brother (I already had the U.K. one) and a SMiLE t-shirt. Jeff then decides that he wants to play a joke on Darian Sahanaja. He tells me to just play along and pretend I’m N.D. Smart. We follow Jeff out of the catering room towards the hallway leading to the dressing room, where we are stopped by the über-guards (despite the fact that our passes say, ALL ACCESS). Jeff explains to them, “These are my guests and they are coming with me” – and the dragoons finally relent. As we are walking down the hall, who should be coming the other way but Brian Wilson himself (with two assistants)! With my camera (and items to autograph) still in my backpack, I only had time to shake his hand and introduce myself. He seemed to have a funny look on his face – maybe it was my “unofficial” SMiLE t-shirt? 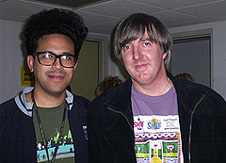 What immediately struck me about Brian was his height – he seemed to tower over me and I’m 6 ft tall. It was only a brief encounter and Brian was gone as soon as we introduced ourselves. We then walk into the ‘lounge’ area of the dressing room, where Scott Bennett & Darian Sahanaja are relaxing. Darian is busy at a little laptop computer and Margaret jokes, “Is THAT the one?” [Refering to the computer that Darian uses in “Beautiful Dreamer” to sequence SMiLE with Brian] Darian quickly responds, “No” and I jokingly add, “I suppose the original is now in the ‘Wilsonian Institute’” . Jeff introduces me to Darian as N.D. Smart and Darian FREAKS, saying “Really? Wow! No Way”, etc. He even does the WAYNE’S WORLD “we are not worthy” bit on his knees. Scott then comments about my SMiLE t-shirt asking where I got it and saying it is really cool. While I am talking to Darian and Scott, Margaret gets some photos, as well as some photos of Taylor Mills, who had just entered the room. At this point Darian asks me what “N.D.” stands for and I start to panic because I have NO idea! Luckily, Jeff Foskett comes to the rescue and states the answer (I was so panicked that I couldn’t remember what the answer was!). I then ask Darian if I could get an autograph and he freaks again saying, “I can’t believe this! I used to play all your stuff!” I pull out my tour programs and my WONDERMINTS CD and a sharpie pen and he asks to personalize it! I stammer just a bit, thinking, “I don’t want my stuff autographed to N.D. Smart” and just tell him, “just a signature”. While he is signing, I ask him about the “Beautiful Dreamer” documentary – and he admits he still hasn’t seen it. I then ask him about the DUMB ANGEL FAIRY TALE and his little “intro” piece to the film. “You saw that?” he exclaims – but before we could talk more about it Jeff suddenly tells us, “gotta go”. I get one quick picture with Darian and we are bound down the hall, again bumping into Brian. Margaret asks Brian for a picture and he poses quickly. I guess this was my one chance for a photo, but Jeff was pressing us to leave. As we are walking down the hallway, Margaret asks Jeff if we can eat (the band has already eaten, so it was not like we were taking food out of their mouths). He said, “Sure” and we enter the catering area again. We get our plates, food, sit down and start eating – just then Jeff comes back and says, “I wasn’t supposed to let you, so eat quickly!” So there we are, wolfing down the catered food before the über-guards eject us from the holy premises. Back in the main arena again, it has already gotten dark and we start to find our seats. I spot Jez Graham [new writer for EAR CANDY and fellow SMiLE enthusiast] who hands me some of his CD’s [Brian Wilson tribute CD on piano] to give Darian when I got backstage after the show. There isn’t really a bad seat at Chastain and we had fabulous seats. But there is a price to pay for such an intimate venue as Chastain – and that is the yuppie crowd that regularly appears at the shows just to “be seen”. They don’t care who is on stage, they are going to talk as loud as they want as they drink their wine and eat their caviar. I bet that if Elvis himself suddenly appeared from the great beyond on the stage at Chastain, these folks would still be yacking away, oblivious to the goings-on! Finally, as the lights came up on the seated band, I could see various members wearing Margaret's "SMiLE" button, including Brian! First was the “unplugged” set by Brian and his band as they sat in an informal semi-circle. Brian doesn’t look happy at all – sure, he sings great, but you get the feeling that he is really uncomfortable. Jeff Foskett supplies most of the interaction with the crowd. Having seen some of the recent setlists on the internet, there are no real suprises as to the songs played. Brian finally speaks before “Wendy”, dedicating it to his daughter. Brian finally opens up during “Drive In”, followed by “Good Timin’” – definitely a highlight for me, since it is one of my FAVE Beach Boys songs and it was great to hear it again live (last time I heard it was back in 1979). After “You’re Welcome” there is a little feedback as the technicians prepare the stage for the full band. 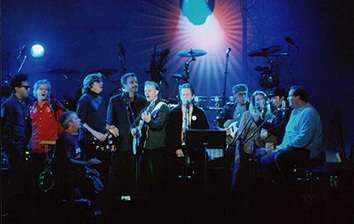 For the “full band” set, Brian played a wide variety of old and new songs, from “California Girls” to “Your Imagination”, and at one point leads the audience in a rendition of “Row Row Row Your Boat”. Highlights of the second set were: “The Little Girl I Once Knew” (always great to hear), “Forever” & “Soul Searchin'” (dedicated to Dennis & Carl Wilson respectively), “Sail On Sailor” (another fave song of mine) and a really rocking version of “Marcella” (maybe this is what Brian means when he says his upcoming album will be “rocking”?). There was then a 20-minute intermission leading up to what I’d been waiting for – the live performance of SMiLE! Right: "Fire" effects during "Mrs. O'Leary's Cow"
From the first notes of “Our Prayer”, I was almost in a hypnotic state. Although I had heard many of the bootlegs of the British shows earlier this year, I still wasn’t ready for the emotions that would flow from actually hearing SMiLE live. Considering the outdoor nature of Chastain, the vocals and the instruments were surprisingly pristine. And, since there have been so many reviews posted so far on this tour, I’ll just touch on a few highlights from the SMiLE portion of the show and any changes from the ‘norm’ (for those of you who have heard the multitude of bootlegs from this tour). “Heroes & Villains” was flawless, the only difference being a slightly different trombone line throughout. The truly transcendent moment for me was during “Roll, Plymouth Rock” (a.k.a. “Do You Like Worms”) – I just kept thinking, “Wow, I AM hearing this live!” Brian actually sang the words to “The Old Master Painter”, which was very surreal considering our discussion on that song just that morning (I guess he remembered?). When I first heard the vocals, I thought that I must be imagining it – then I concentrated on Brian’s face and could see his lips moving! Brian was more relaxed during the SMiLE portion of the show, playfully starting his drill for “Workshop” while the band was still playing “I Wanna Be Around”! During “Workshop” he spoke to the audience for the first time during the SMiLE segment, saying “It’s supposed to be funny!” During “Vega-Tables” there was some waving around of…of course…vegetables during the song. As the band started “Wind Chimes”, there was enormous applause from the audience. I was a little surprised as I never thought it would get such a good response as opposed to some of the other songs. And of course, the other highlight of the show was hearing “Mrs. O'Leary's Cow (Fire)”! 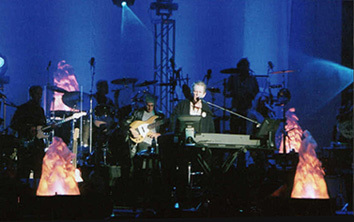 During the song there were little 3-dimensional flames all around the stage, the orchestra was wearing fire helmets and two members of the band grabbed a fire hose and pretended to fight a fire. Not that we needed any visuals, because this song just takes you to a “fire”! Finally, everybody was up on their feet during “Good Vibrations”, which is probably the definitive Beach Boys song. Although Brian sang the “new” vocals (yep, being sarcastic here), everybody was singing along to the chorus. The encore section was basically the “greatest hits” portion of the show, sure to please all of those who are only familiar with the early Beach Boys catalogue. There was a minor technical glitch when Probyn’s guitar on the lead break of “Do It Again” was non existent. The crowd was on their feet, singing along for this entire “blast from the past” section. Finally, Brian ended with a slightly new arrangement of “Love And Mercy” – a great song and a great way to end a very memorable concert! Alas, SMiLE was over. It seemed like a blink of an eye, but seeing it live has to rank up there among my all time greatest concert experiences!